The ANTOP Paper Thin Indoor HDTV Antenna, AT-108 features a super soft and slim design (less than an inch thick, 0.03''), is aesthetically pleasing, and suitable to match a wide range of home décor styles. Its compact size allows you to position the antenna almost anywhere in your home. The AT-108 supports HDTV, 1080P TV and 4K ULTRA HD, and is compatible with TV converter boxes and digital TVs. The number of TV channels and programs that you can receive for FREE depends on the amount of over-the-air broadcasters in your area. With the ANTOP AT-108, there is no monthly fee and no need to subscribe. Just plug into a TV, scan the channels, and then enjoy your TV shows! - Scan channels monthly to find all available channels including newly added or changed. 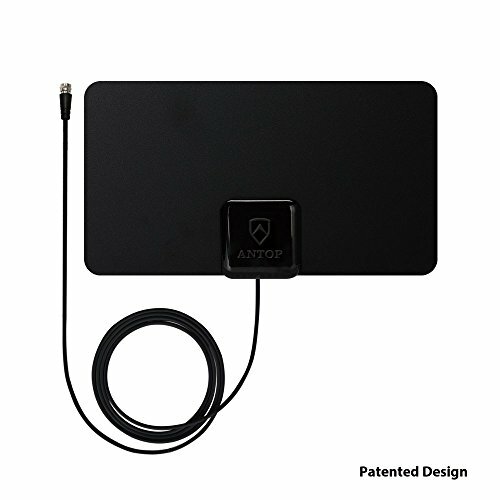 ★ Cut the Cable - Enjoy FREE local over-the-air high definition TV broadcasts from available networks in your area such as, ABC, CBS, NBC, PBS, Fox, Univision and others with the ANTOP AT-108 Paper Thin Indoor HDTV Antenna, NO monthly fee or subscription required. ★ Engineered and designed in the USA by ANTOP, the antenna specialists. Super soft, lightweight and slim, less than an inch thick (0.03") but still delivers on the ANTOP promise of a quality HDTV viewing experience. The AT-108 features a multi-directional reception pattern and signal range of up to 30 miles from point of origination. ★ Quick and easy set-up on any flat surface. Includes double sided application sticker and 10ft. high performance integrated coaxial cable. If you have any questions about this product by ANTOP, contact us by completing and submitting the form below. If you are looking for a specif part number, please include it with your message.